You will receive an email announcing each of our concerts. View our data protection statements. Enter your email to subscribe to our newsletter announcing each concert a few weeks before they occur. We will not use your address for any other purpose. See our privacy policies for our policies on data protection. The FSO consistently produces music of a very high standard and together with highly talented soloists provide wonderful evenings full of happiness and light. Over several years we have been to many concerts given by The Finchley Symphony Orchestra (and occasionally with the Finchley Chamber Choir). Our policy is that - if we are free, Trinity Church, Finchley, is the best place to be - sometimes challenging, but always offering an evening of fine music, beautifully played. 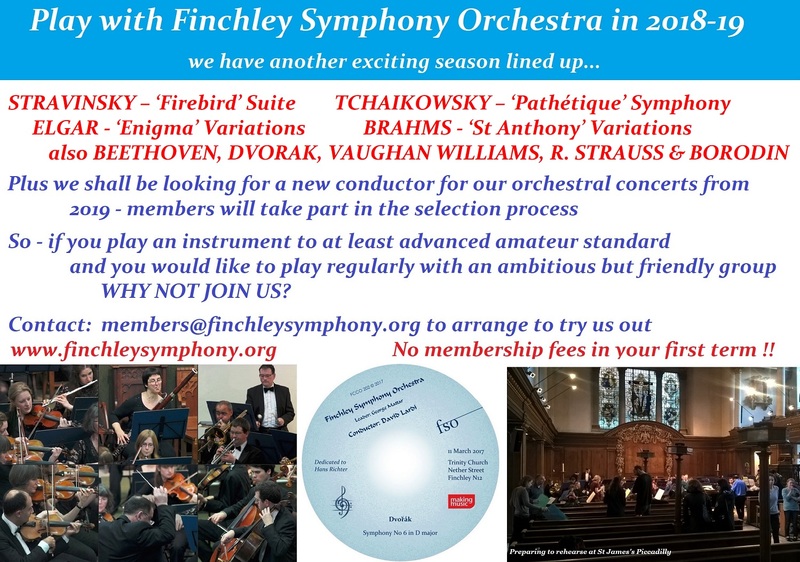 [Finchley Symphony Orchestra is] a top draw symphony orchestra with first class soloists without having to go to the Festival or Albert Halls. Everything from baroque to large scale romantic works, 20th century music and new commissions. Symphonies, concertos and – at Christmas – carols! After our ambitious Russian evening including Stravinsky's 'Firebird' suite and the ever-popular Christmas concert with Finchley Chamber Choir we have moved on to explore a rarity: Dvorak's tone poem 'The Water Goblin' which we will perform alongside Tchaikovsky's 'Pathétique' symphony and Richard Strauss' first Horn Concerto with Alexander Edmundson, a young co-principal with the LSO. Programmes later in the season include Brahms, Elgar, Vaughan Williams and Beethoven. We have been running conductor trials since the beginning of 2019 as our previous Musical Director, David Lardi, is cutting down his workload and will only be conducting us in joint concerts with the Finchley Chamber Choir in the future. After an interview stage we selected candidates to take trial rehearsals with us, and this term we are delighted to have Tom Hammond conducting us for the remainder of the rehearsals and the May concert. Nigel Kennedy, Tasmin Little, Valeriy Sokolov and many others. Browse our Artists page to see more. Enjoying playing great music together, working hard for a high-quality performance, and celebrating it afterwards! Finchley Chamber Choir – our sister choir with whom we perform regularly. Your browser does not support the web technology required to use Google Maps on this website. Please update it to improve your browsing security and experience. Finchley Symphony Orchestra is affiliated with Making Music. Website © 2018 David Park – admin access.